In part 1 of Stacey and Barry’s Estepona Beach Club wedding we learnt all about their beautiful chosen wedding venue and how they had visions of combining his Irish heritage with Stacey’s Persian roots, in this stunning location on the Costa del Sol. For her big day, the bride envisaged the elegant white décor of the beach club to be enhanced with a touch of rustic vintage glamour. She chose a baby blue colour scheme for the day and her three bridesmaids were dressed in delicate chiffon light blue dresses complete with vintage flower hair garlands. This was complemented by pink, white and gold details such as the light pink hydrangeas covering the ceremonial pergola, the chalk board signs and lanterns and paper parasols lining the aisle. Even the cake was a pretty light pink ruffled creation that mirrored the romantic simplicity of the beach club. The guests arrived and were wowed by the exotic beach-side venue, taking their seat for the ceremony facing the sparkling waters of the Med. The guitarist duo, The Latin Twins, strummed a haunting Spanish tune as Barry waited nervously at the end of the aisle. Our couple had watched the guitarist brothers play before in various Puerto Banus venues and knew that they would be the perfect accompaniment to the ceremony. As Stacey walked down the aisle, magnificent in her fitted white gown and traditional long flowing veil, set off against the tumbling locks of her long dark hair styled by Spanish hairdressers Maite, there wasn’t a dry eye in the house. The perfect wedding was complete with Padre Peter, the kookiest and most popular celebrant for the Costa del Sol, giving a beautiful service. Guests were seated pool-side for their meal to the sounds of Peter Rothwell singing live. Each beautifully decorated table was named after a local Beach Club, a lovely touch that reflected the couple’s love for the area. Guests enjoyed a choice of prawn and avocado or duck salad starter, and steak or sea bass, followed by a delicious chocolate fondant and vanilla ice cream. Following the speeches the party got going! Cheeky chappy Ian was the DJ and accompanying him was Quike and his famous violin of lights, playing dance music and packing out the dance floor. The night was a wonderful multicultural mix of traditions, with a chill out area where guests could enjoy Shisha Pipes and a sit down, and Stacey and Barry even treated their friends and family to a live rendition of the Spanish song Bamboleiro by the Gipsy Kings! As the sun set behind the mountains and the sky turned Lapis blue, one word was lit up large and reflected in the beach club pool. LOVE. Well of course, what wasn’t there to love about this wonderful couple and their marvelous day in the Estepona Beach Club venue of their dreams. The next day, as the guests nursed their sore heads and exchanged stories of what a fantastic time they had had at the breathtaking Spanish beach wedding, more treats were in store. We organized for a Spanish tapas meal and plenty of local wine for a last ‘Adios’ in Marbella’s oldest building, complete with traditional cobbled patio and a starlit sky. 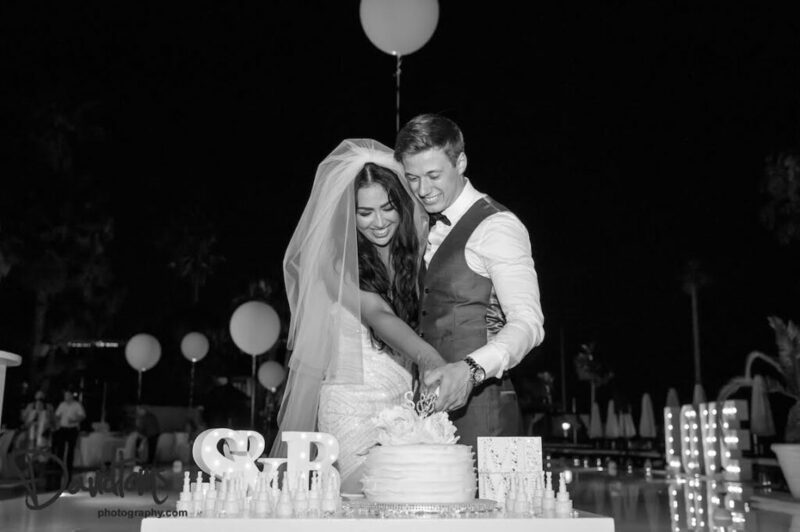 Stacey and Barry certainly succeeded in their wedding vision… They got elegant vintage at their Estepona Beach Club wedding, they successfully mixed the traditions of Spain and Persia and most importantly their guests had an unforgettable three day celebration in true fun-loving Irish style!